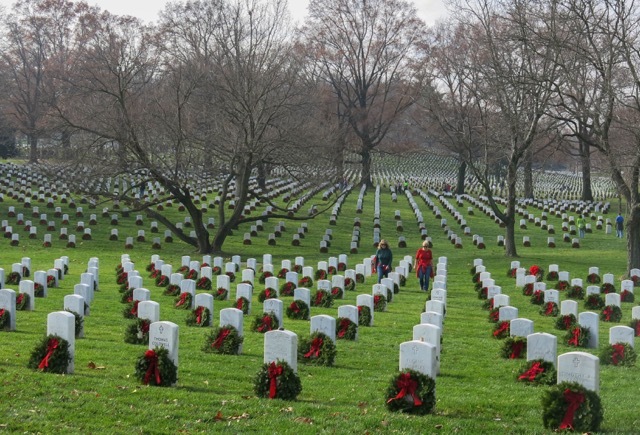 On Saturday December 17th the Rotary Club of Leesburg will be participating in Wreaths Across America. Like we did last year, the Club will be providing 3 buses. The buses are going to be filled on a first come, first serve basis and are limited to a total of 50 passengers. Each seat will cost $10 per person regardless of whether you are a Club Member or Guest. The buses will be leaving at 6:30 am sharp on December 17 from Heritage High School in Leesburg and will be returning around Noon. Please be at Heritage no later than 6:15 am. This will get us to the Cemetery early and ahead of the start to get set up. Coffee and Donuts will be provided for the bus ride. You are more than welcome to meet us at the Cemetery if you would prefer to drive yourself, we should be there around 8:00 am and we will provide details of where our trailer will be. We will be responsible for unloading/distributing wreaths from two of the tractor trailers. Volunteers are needed to help unload the boxes and pass out the wreaths. Also, as in past years, our Interact Club from Heritage High School will be joining us.